Germany witnessed just about every type of severe weather over the past two weeks – tornadoes, golf ball size hail and severe straight-line winds. This past week the atmosphere was primed for a second round of severe weather in the southwest part of Germany as a stationary front was draped across the region. The front separated warm moist air from the Mediterranean and cool air to the north of it, providing a sufficient trigger for storms. Modest MLCAPE values and veering wind profiles were also in place which meant that all the ingredients were in place for supercells. On Wednesday the 13th ESTOFEX, which issues forecast categories of potential danger for severe thunderstorm days (similar to the Storm Prediction Center), issued a level two threat – one below the highest level. 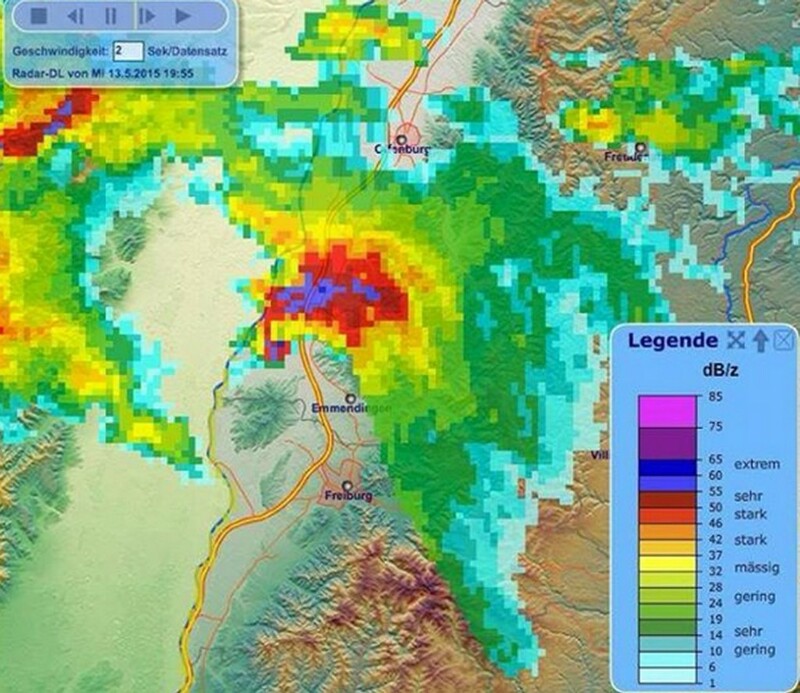 One impressive supercell formed just north of Freiburg, Germany which dropped 5cm diameter hailstones on the outskirts of the city – these reportedly injured a dozen residents. As it continued further east-northeast, the storm went on to produce what residents called a tornado, which damaged about 150 homes in Stettenhoffen and surrounding areas. The “tornado’s” strength is still being investigated and meteorologists are also looking at the damage paths to see if it was in fact a tornado or simply very strong straight-line winds. Some residents were injured from debris but luckily no one perished from the nasty storm. These storms come about a week after a severe weather outbreak hit Germany in the first week of May. 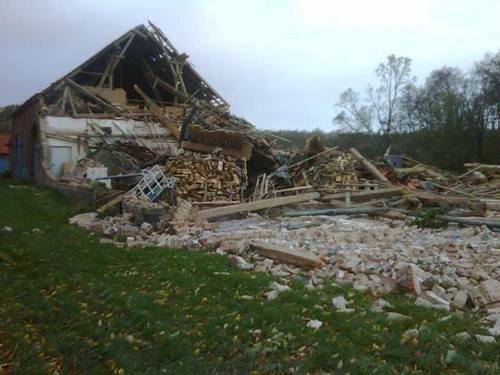 This outbreak consisted of several tornadoes in northern Germany as well as a potent bow echo that raced across the region bringing gusts of over 120km/h. It has been quite an active pattern to start off this past week across Western Europe. The pattern favoured severe weather and brought numerous modes of it to the region, including very large hail and damaging winds. A trough of low pressure was sitting just offshore, over the Atlantic Ocean, with a ridge over most of Europe advecting in warm, moist air to the region. As the upper level trough shifted further east, a surface low pressure over the North Sea, with a cold front extending southwards, also pushed east into a very unstable atmosphere setting up for a severe weather outbreak. Sunday through Wednesday all offered severe weather opportunities across the region. Last Sunday night a severe thunderstorm hit Brussels bringing with it large hail. 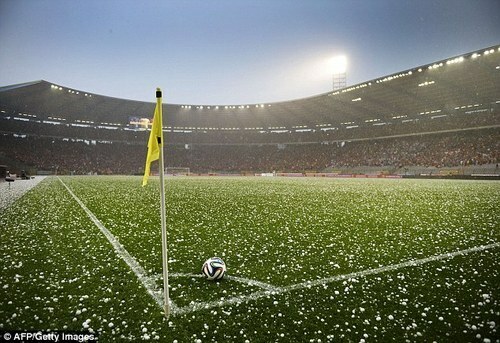 Hail the size of ping pong balls could be seen littering the city which postponed a World Cup exhibition game that was being played in the city. On Monday night, a completely different storm affected parts of Germany. A powerful bow echo raced across the country bringing winds as high as 142km/h in Düsseldorf, one of Germany’s largest cities. 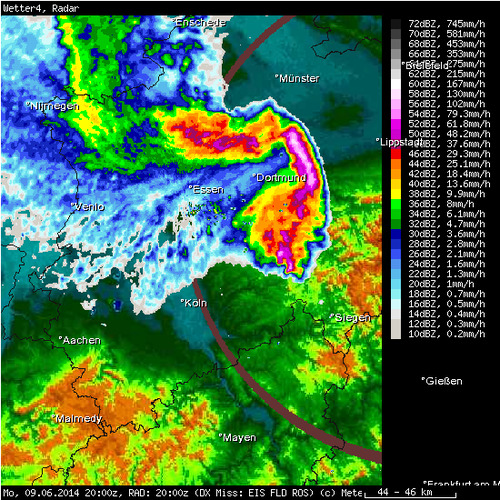 Numerous other reports over 100km/h were reported with the bow echo. Significant damage was reported with trees uprooted by the straight-line winds which also contributed to six deaths in the country. Since then, calmer weather has moved into the region with more of a northwest flow aloft and colder temperatures. No severe weather is expected in Western Europe this weekend. An extremely powerful mid-latitude cyclone sitting off the coast of Scotland affected parts of Europe such as England, Denmark and Germany early last week. Winds were the main threat associated with this storm as gusts reached just below 200km/h in Denmark. The reason why this storm was not classified as a hurricane, even though it had hurricane strength winds, is because hurricanes have a warm core and do not have well defined fronts like low pressures systems do. Here, a mid latitude cyclone was the case as fronts were well defined and other various characteristics did not match one of a hurricane. In total, 15 people died from this storm, most due to falling trees. This storm left about 500,000 people without power as trees snapped like twigs and fell on power lines. Off France’s coast waves as high as 5-6m were reported and about 1,300 flights were grounded because of the strong winds. These very powerful low pressure systems are not unheard of for Europe, though storms with gusts of this intensity do not occur on a yearly basis. This low has since moved off into Russia and is no longer affecting the region. Gusty conditions are expected to return to the UK this weekend as an active pattern, which is not out of the usual for this time of the year, continues. In other weather news, an unusually strong typhoon (Krosa) has spun up and as of Friday night was of category three intensity. Conditions are not particularly favourable for further development in the South China Sea and the typhoon should gradually weaken as it drifts towards Vietnam. 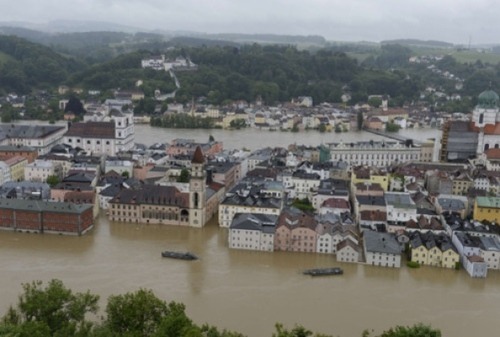 Major flooding has swept across central parts of Europe where Slovakia, Germany and the Czech Republic have all experienced crippling flooding this past week due to extreme rainfall. Amounts of 75mm were widespread across that part of the continent, and near the Alps, significantly higher amounts of precipitation were observed (some as snowfall at higher elevations). A few reports of 150-200cm of snow were recorded in Austria and Germany at high elevations. Rivers such as the Danube and Elbe have reached levels last attained 11 years ago and are threatening or have already breached sandbag dikes in some areas. Over 300,000 sandbags and counting have been prepared and put in place to prevent both rivers from overflowing their banks. The threat of a flood has forced residents out of their homes – as many as 40,000 people have been forced to move away from the nearby dikes and up to higher ground. The flooding upstream also has residents in Hungary, especially Budapest, worried as the Danube River has not crested yet but is expected to reach its peak later this weekend. Dikes there are expected to hold if the current crest projection is correct; it is believed the crest will be about a foot below maximum capacity. Unfortunately 17 people have already lost their lives to the rapidly rising floodwaters and damage estimates top the 15 billion mark. Crop damage is widespread across Germany where over 250,000 hectares have been flooded out. The forecast for central Europe calls for some rain on Sunday, associated with a trough but these showers will be nothing near as significant as what was experienced last week.